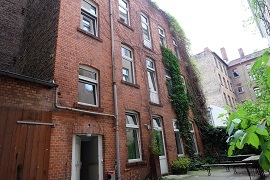 Hostel, cheap accommodation in Berlin Kreuzberg (low budget: single room, double room, shared room, apartment, apartmentst, Hostel in Berlin Kreuzberg). Are you looking for cheap and central accommodation? You don’t value TVs or overpriced minibars, but want a clean, quiet room in a lively part of the City? Then you’ve found what you’re looking for! 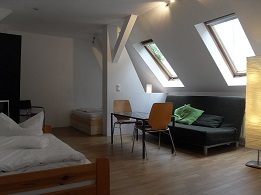 We offer affordable rooms and apartments in the centre of Kreuzberg. Our guesthouse, a lovely redbrick building, constructed at the turn of the century, is in the second courtyard and is therefore absolutely quiet. While the nightlife is thriving just outside the door, you can sleep undisturbed. Our rooms and apartments are variably furnished to suit seminar visitors, backpackers or families and groups. There are single bed rooms, double bed rooms and multi bed rooms (partially equipped with bunk beds), as well as three apartments with a fully functional kitchens and bathrooms. In the case of the rooms there is one shared bathroom situated in the hall between the two rooms. If you are looking for a more comfortable room then the top floor apartment is for you. This room also has a TV. We do not have dorms (dormitories) . Free WLAN is available throughout the guesthouse. Sheets and towels are included in the price. Do you need a baby bed or a kettle? We will happily fulfill special requests, wherever possible, at no extra cost. 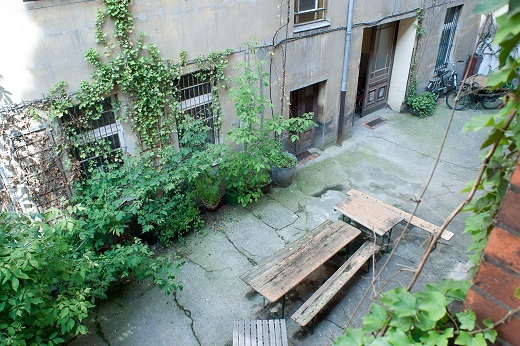 Our small hostel, a former factory, lies in a colourful and multicultural neighborhood, directly by Görlitzer Bahnhof. The legendary Oranienstraße famed for its bars, cafés and clubs, the East-Side gallery, the Turkish market – this and much more is just a short walk away. On Thursdays you can stroll through “Street Food Thursday”, go to a concert in the Lido or enjoy the booming nightlife the city has to offer. In the close neighbourhood there are many clubs, pubs and bars. If you prefer a quieter scene you can walk through the well known Turkish market along the bank of the Maybach or sit down in one of the many cafés or restaurants on the bank of the river. From here you can also catch a ride on a boat which will take you on a tour along Berlin`s canals and river Spree. Other tourist attractions are easily reached using the reliable public transport system. The U-Bahn station Görlitzer Bahnhof is only a one minute walk from the hostel. From here there are direct connections to City-West (Kudamm). The City- Ost (Hackescher Markt, Alexanderplatz) ist also reachable within 15 minutes. We can house up to 35 guests in our hostel. We are a small team and are looking forward to seeing you, whether you are visiting relatives, running in the Berlin marathon or going to Christopher-Street-Day. 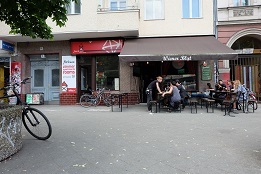 We have been living and working in Kreuzberg for a long time and will happily tell you, where to go for the best food or where to loan some bikes. We know the latest beach bars and will happily give you directions to the best places Berlin has to offer. We want your stay in Berlin to be a unforgettable one! In the immediate vicinity of the river Spree and Alexanderplatz there are two high-rise buildings in which we offer multiple apartments. The houses are modernised and offer all the comforts, from a personal parking space to a security service. Some of the guest-apartments offer a stunning view over Berlin. For “New-Berliners” from all over the world Freiraum offers the perfect start into your own apartment. Our office in the same building organises temporary contracts for flats and rooms. 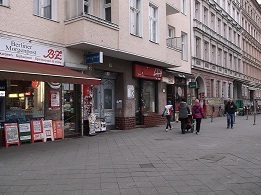 Our hostel is located in the multicultural centre of Kreuzberg and is surrounded by bar and cafés. There are a wide variety of international dishes to choose from, ranging from the cheep takeaway to the gourmet restaurant. Here you can experience the Berlin nightlife like nowhere else.